This morning after breakfast visit The City Of Srinagar. The world famous Mughal Gardens visiting the Nishat Garden known as ‘Garden of pleasure’ built in 16th century (1633) by Mughal Emperor Asif Khan. Then visiting Shalimar Garden known as ‘Garden of love’ built in 16th century (1619) by Mughal Emperor Jahangir for his beloved wife Noor Jehan or (Mehr-un-Nissa) The Chasme Shahi also knows as Parimahal Garden and then pay visit to famous Shankaracharya Temple situated on top of Hill where you can have a view of whole Srinagar City. Also you can visit Hazratbal Mosque is located in a village of the same name on the banks of the Dal. Its pristine white marble elegance is reflected in the waters of the lake. Hazratbal's special significance is derived from the fact that it houses a hair of the prophet Muhammad. The old city Of Srinagar many ancient shrines and mosques among which the shrine of Shah-i-Hamdan, who came from Persia in the 13th century, was responsible for the spread of Islam in Kashmir. Khanqah-i-Mualla, on the banks of the Jhelum. Was built in his memory. Makhdoom Sahib / Hari Parbat Fort, Jamia Masjid in the old city of Srinagar In the evening return to Houseboat. Overnight at Houseboat. This morning after breakfast you will have Full day excursion to Sonmarg which is the most beautiful drive from Srinagar. On the way we stop at many beautiful spots. Continue drive to Sonmarg 2690 mtrs (Meadow of Gold). One can ride on horse to visit to Thajiwas Glacier where snow remains round the year and Sonmarg is known as Gateway of Ladakh. In the evening return to Houseboat. Overnight at Houseboat. This morning after breakfast drive to Pahalgam 2440 Meters (Valley of Kashmir) on arrival check into your hotel and rest of the day is at leisure. Stay overnight at hotel. This after noon you can Visit the Pahalgam also known as ‘The valley of Shepherds Paradise. Pahalgam is the most famous place for Indian Film Industry. The town of Pahalgam offers breath-taking views. One can just enjoy the town of Pahalgam trek to some of the most beautiful places on earth. Pahalgam is also the entry point for the famous Amarnath Cave, a holy site for Hindus Overnight at Hotel in Pahalgam. This morning after breakfast you will drive to Gulmarg On arrival check into your hotel. Enroot you will visit the way visit Saffron field and Avantipur ruins, which is eleven hundred years old temple. Gulmarg which is one of the most beautiful summer resort in the valley. It is also popular for its highest golf course in the world and skiing during the winter season. One can have Gondola ride (cable car) from Gulmarg to Khalinmarg. Stay overnight at hotel in Gulmarg. Today you will be transferred to Srinagar airport to take a flight to Bhubaneswar. for your onward journey. * 1 Nights accommodation in Pahalgam hotels with breakfast & dinner on twin sharing basis. * 1 Nights accommodation in Gulmarg hotels with breakfast & dinner on twin sharing basis. 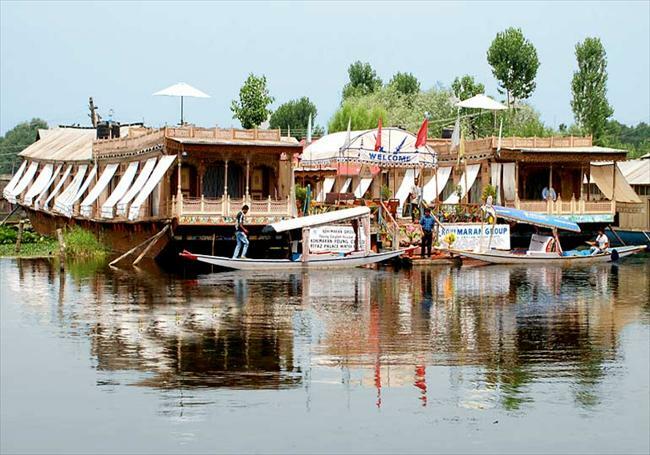 * Flight Tickets, Bhubaneswar to Srinagar & Srinagar to Bhubaneswar in economy class.